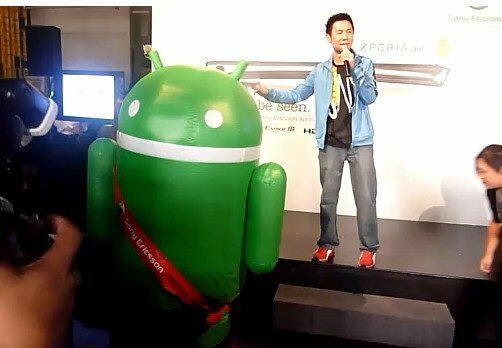 It appears that when it comes to promoting the Android 2.3 Gingerbread toting Sony Ericsson Xperia Arc smartphone all you really need is an all dancing green Android robot, just like we’ve previously see strutting their stuff (here). Yes folk’s the dancing Android robot is at it again, this time in Malaysia, and the poor person inside the costum much be tired as this dance off isn’t quite as good or funny as the previous dance in the Sony Ericsson Xperia Arc promo in Taiwan. Still footage of the little green Android mascot is still footage so we have that footage for your viewing pleasure below courtesy of the guys over at Phandroid and by way of Android Central and YouTube user Soyacincautv. But the big question is who is inside the Android robot costume, is it a male or female dancer bopping all over the show? Will we find out the gender of the energetic little green bouncer? Hit that play button to see if we find out…enjoy.